The Business Growth Programme will be hosting events and masterclasses across the region to support the growth of local businesses. Write ups of such events will be posted on this page. For details about upcoming events/support/masterclasses delivered by the progamme please visit our Events Page. To sign up to the programme please click here. In November 2017, Reaseheath College held a series of workshops specifically designed for start-ups and SMEs within the Food and Drink Industry. Topics covered at the workshops included food product development, scaling up production and optimising product offers for target markets. Upon completing the course, participants understood the product development cycle and how to get these products on supermarket shelves. They also learnt which equipment and facilities they would need in order to scale up their businesses. There will be more dates added in 2018 for these workshops. These will be announced soon. Watch this space. Reaseheath College held a series of workshops in October and November 2017 designed to enable customers and suppliers to develop sales and negotiation techniques in order to facilitate business growth. The course covered a range of topics including the relationship between salesperson and customer, how to pitch your product or service and how to evaluate your performance. Start Up success is delivering key business strategy and planning skills to potential Entrepreneurs based on the business model canvas. Delivered over a series of 10 sessions this course has attracted entrepreneurs over a range of disciplines including food, floristry, wig making and a celebrant. This series of workshops will be running at Reaseheath College until March 2018. To attend these or similar workshops, please click here. Key speakers at the event delivered talks about their own personal experiences as a business owner, and inspired course participants with stories of their business’ journey. The session helped students understand the fundamental elements of setting up a business and gave them the confidence to take their own business ideas forward. To attend similar events at Reaseheath College, please click here. Reaseheath College, a delivery partner of the Cheshire and Warrington Business Growth Programme, recently delivered a bespoke financial planning course which enabled participants to understand the key financial elements of their business. The Centre for Enterprise at Manchester Metropolitan University (MMU), one of the delivery partners of the Cheshire and Warrington Business Growth Programme, was delighted to see 23 business leaders based throughout Cheshire and Warrington recently graduate from a dedicated 5 month fully funded business support programme. The businesses ranged from start-ups to established SMEs and came from a diverse range of sectors including digital technology, finance, sports and leisure, marketing and training and education. The delegates signed up to the programme back in September 2016 and included expert workshops in topics such as finance, recruitment and HR, leadership and sales and marketing. Key benefits of the specific business support programme delivered by MMU include the peer-to-peer discussions and observations. Businesses attending benefit from professional advice, the opportunity to discuss business challenges, sharing best practice with other businesses and networking opportunities. The course, designed to promote business growth in the region as part of the larger business growth programme, has helped previous participants to expand their businesses and enhance their business leadership and management skills. The next specific cohort delivered by MMU starts in April 2017. Applications from businesses with potential for growth are encouraged to register their interest after which point they will be contacted by the most suitable delivery partner to discuss the most appropriate support needed for business growth. The photos show business leaders from the latest cohort of the Cheshire and Warrington Business Growth Programme (CWBGP) enjoying their induction day at the Manchester Metropolitan University Crewe Campus. The induction is a chance for participants to get to know one another before taking part in a series of business growth workshops. These are offered (with no charge) to small businesses based in Cheshire and Warrington as part of the growth programme, managed by one of the programme’s delivery partners ‘The Centre for Enterprise’ at Manchester Metropolitan University. Read more about the programme. Local SMEs learnt all about digital marketing at a recent master class held by delivery partner the University of Chester. The session was designed to develop an understanding of digital marketing along with suggested strategies and tactics that best suited the needs of the individual attendees. The importance of having a digital marketing strategy was emphasised, and delegates learnt how to maximise success for their business from the different digital marketing platforms. The main areas of discussion included social media, search engine optimisation (SEO), email campaigns, pay-per-click (PPC) and content management. The businesses that attended were given the opportunity to develop digital marketing action plans that could be implemented immediately, making the session extremely practical and insightful. The class was delivered as a result of demand for digital marketing support. To attend future events please visit our sign up page. Warrington Collegiate one of the Cheshire & Warringon Business Growth Programme delivery partners recently delivered a social media masterclass. The session focused on the use of Facebook, Twitter and Instagram teaching clients how best to use such social media channels to promote and advertise their businesses. Clients completed the class having set up the relevant social media accounts for their business and the starter knowledge required to build on their channels and marketing opportunities. The class was delivered following demand for social media support from businesses signed up to the programme. To sign up to the programme please visit our dedicated sign up page. MMU, one of the delivery partners for The Cheshire and Warrington Business Growth Programme, has recently started a second cohort of the programme. Roxy Lawton, Project Manager for the programme, led the group of 25 companies, including five prestart-up businesses. 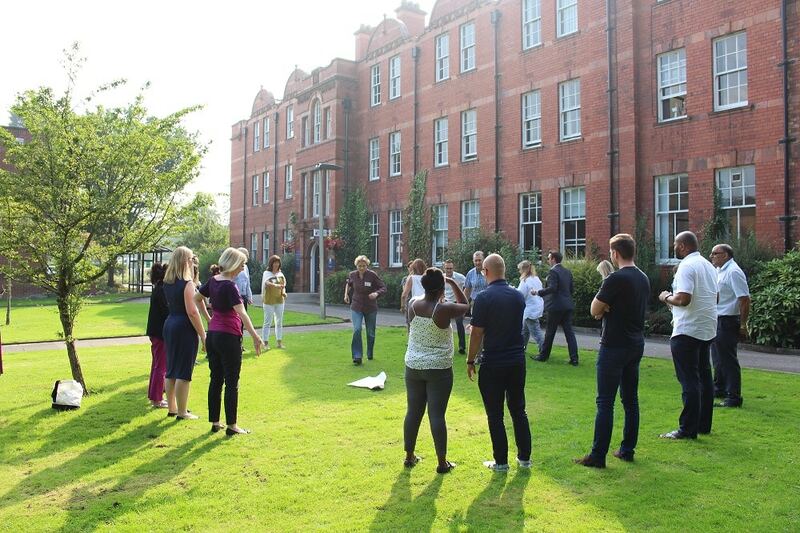 The participants came together at the Manchester Metropolitan Crewe Campus for a day of workshops, introductory exercises and icebreakers. Throughout the course, the participants will benefit from peer to peer advice and support which is an invaluable part of the programme. They kicked off the session discussing ‘business growth’, understanding that it is not simply a matter of growing staff numbers, and can include profit, additional services, expansion of clients, and many other factors. Isla Wilson from Ruby star Associates delivered an interactive workshop on identifying the difference between being strategic and operational. Depending on the business leader’s long-term aim, they may want to have a business that relies on them being very hands on or a business that can function without them. She also covered innovation, and the fact that all companies need to give innovation a chance. We would like to congratulate all the businesses on their brilliant contribution to the day, and we look forward to working with them all, and helping them grow in the coming months. To apply for support from the business growth programme, fill in the online form.